When you visit someone else's property, you do not expect to be harmed. 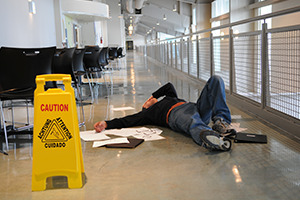 However, slip and falls, chemical exposure, explosions, or even criminal acts can seriously hurt a visitor on property. Depending on the visitor's legal status, it may be possible to bring a claim with the assistance of a Chicago premises liability lawyer to seek damages for harm suffered due to a dangerous condition. The personal injury attorneys at Moll Law Group are experienced advocates for Chicago residents and other people in Illinois who have been hurt on hazardous premises, including stores, amusement parks, schools, churches, day care, parking lots, playgrounds, restaurants, and swimming pools. The types of harm that may arise in these situations range from assaults and child abuse to drownings and slip and falls, as well as accidents involving falling merchandise, poor lighting, or faulty handrails, guardrails, and stairwells. Whether you can recover damages in a premises liability lawsuit usually depends on whether the property owner or occupier owes you a duty to keep the premises safe or provide warnings of dangerous conditions. This is an issue of law that courts may determine at the start of the lawsuit. The court may consider several factors when deciding whether there is a duty, including how foreseeable an accident was, the likelihood of injury, how great the burden of protecting the plaintiff from injury was, and the consequences of placing the burden on the defendant. Different duties are owed in connection with various types of dangerous property conditions. There is absolute liability for any ultra-hazardous or intrinsically dangerous activities, for example. Under the Premises Liability Act, the duty to invitees or licensees (people lawfully on the property for either business or social reasons) is reasonable care under the circumstances. A property owner or occupier only owes a duty not to willfully or wantonly injure trespassers. These are people who go onto someone else's property without express or implied permission or another right. Failed to use reasonable care to protect you from the danger. Generally, landowners are not liable for injuries caused by a condition of the land or an activity on the land when the danger would be known and obvious. However, there are situations in which a landowner can anticipate that the condition will harm the visitor, even though it is obvious. There are ways to counter an "open and obvious defense." For example, if the landowner should know that the visitor will be distracted and will therefore not notice what is obvious, the landowner may be held responsible. Or, in another example, when a landowner knows or has reason to know the visitor will encounter a hazard because the benefits of encountering a hazard outweigh the risk, the landowner also may be held liable. This usually applies when a visitor has an economic reason for encountering a hazard. For example, an independent contractor who is hurt while trying to do work for a large construction project may choose to encounter a hazard so that he can get paid. At Moll Law Group, our Chicago lawyers are skilled in many personal injury claims, from premises liability to car accidents and medical malpractice. We may be able to help you recover compensatory damages if you have been hurt on someone else's property. Our attorneys also provide legal representation to people in Naperville, Schaumburg, Wheaton, and communities throughout Cook County. Billions of dollars have been recovered in cases in which we have been involved. Call us at 312-462-1700 or use our online form to set up a free consultation with a Chicago premises liability attorney.